guess.” I hope everyone is able to find this information useful. DOMINANT form of black which causes bi-colors, or pure black and whites. 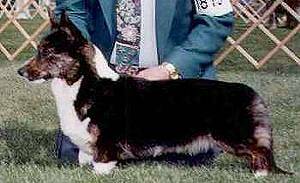 All black Cardigans are tri-color, having either tan or brindle points. modifiers (and no, I don’t know what it would look like). 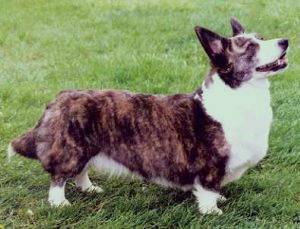 Brindle is a dominant modifier.Only one gene is necessary to express the brindle color — in other words,you have to have a brindle parent to get a brindle puppy. 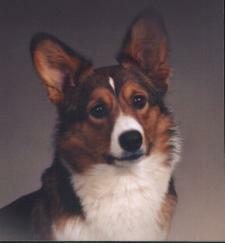 All brindles carry at least one red gene. 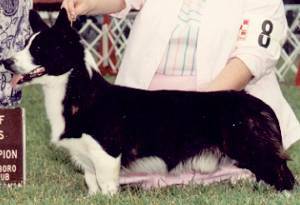 A black and white Cardigan with the brindle points is a black and white with the brindle modifier. 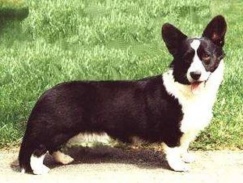 few darker markings, to almost black with a few lighter markings. 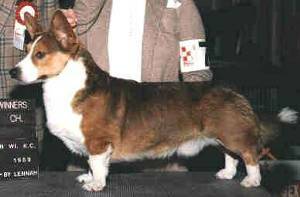 Most brindles appear striped, although some only have different shades of brown that seem more patchy. All shades of brindle are acceptable. Some examples are below. These are brown brindles. 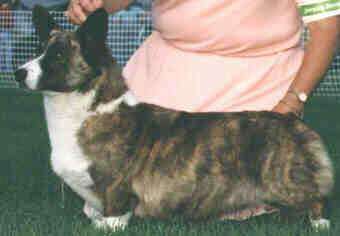 This is the most prevalent shade of brindle. Their base coat is reddish to chocolate brown with light and dark shadings. This category is hard to predict for genotype. 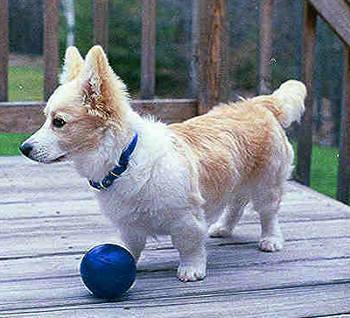 All of the above dogs carry black, but some brindles the exact same shade do not carry black. Also notice the second dog does not have discernable stripes. He is a shaded” brindle. brindles. Their base coat is dark brown to black-brown with lighter shadings. These are brindle point tris. the dog at right has very large extension of her brindle points. 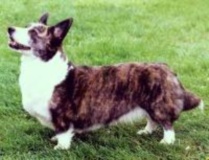 homozygous for brindle, just like other brindles. 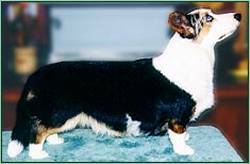 Merle is a dominant modifier gene.This gene modifies the black hairs to turn all affected areas shades of mottled gray. 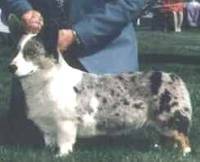 The gray can be light silver to dark gun-metal.Patches of black appear in the coat in varying degrees.Pigmentation is normal black, although areas affected by the merle gene will appear to lack pigmentation. These areas include the nose, lips, and eyes. 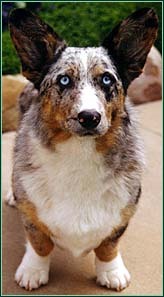 Breeding two merles together may result in a homozygous merle.These dogs are usually predominantly white.A large majority of homozygous merles are born deaf, but the occurrence of the other health problems are rare.All shades of blue merles are acceptable.Merles other than blues (brindle merle, sable merle, red merle, homozygous merle) are a breed disqualification. the dog on the right has very little black patching. random black hairs in their coat. A true sable may have some random black hairs also, but unless the red hair is black tipped and forms a pattern, this is not a true sable. 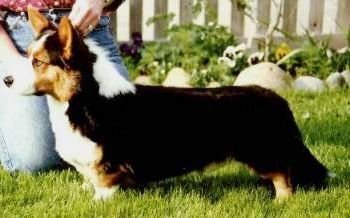 expressed on red hair, a brindle or black may carry the sable modifier without expressing it. brindles, blacks and merles will all appear as some shade of red. time it is an acceptable color, as long as their noses appear black. 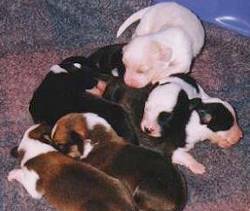 brindles by breeding.A clear red puppy (in back) at less than a week of age among normal red (in front) and brindle puppies. 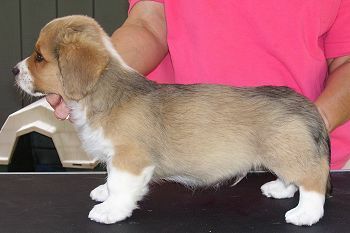 Puppy #1 at maturity — he appears to be a normal red, but look at his nose color. Even in this picture you can see it is not black. black mask can cause a “faux saddle” on the dog’s back. 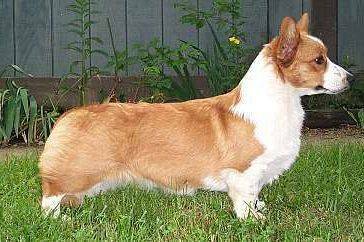 This saddle usually remains as a dorsal stripe and is different from the sable saddle that extends down the sides of the dog and is actually caused by black-tipped red hairs.Masks appear on reds, sables and brindles, but any color can have a black mask. The black masking gene may be partially responsible for the varying amounts of point area showing on blacks. because the gene suppresses the expression of black. Masked dogs of otherwise acceptable colors are also an acceptable color. Varying degrees of black masking on brindles. Although black masks are possible on any shade of brindle, it is easier to see them on red brindles, so I have used this color to illustrate brindle masks. Light to heavy masking on reds. Notice the increasing amount of black on the backs. The dog on the right has a heavy saddle. etc. 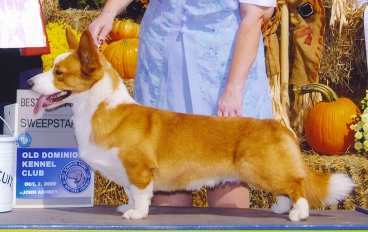 ); one dilute (brown merle); or both dilutes (fawn). The brown dilute is a recessive gene. 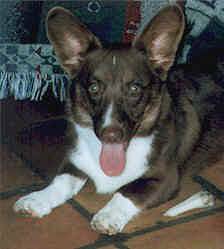 In order to have a brown dilute, both parents may be normal colors, but both must carry the brown dilute gene.The brown dilute is also called “dudley.It affects all black on the dog turning it chocolate brown. This includes coat and pigmentation. 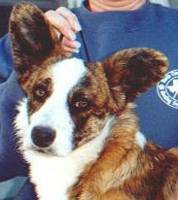 A brown dilute will have a brown nose, lips and paw pads. 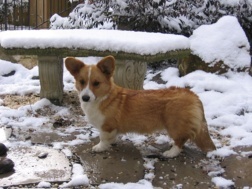 Since this gene does not affect red or tan, the point color will be normal. 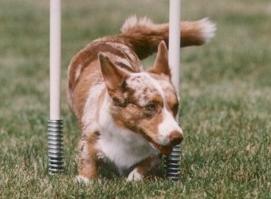 Brindles and reds with the brown dilute are usually identified by nose color. A dilute can be inherited along with any of the Cardigan colors and/or modifiers. 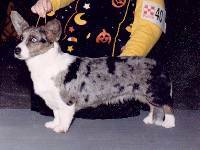 Although the blue merle pattern is left intact in brown dilutes, a brindle will not have a normal pattern — it will either be absent or very faint. 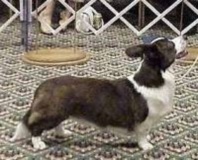 All brown dilutes are breed disqualifications because of their brown noses. Left:a brown dilute merle and normal blue merle. 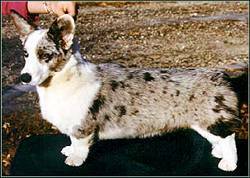 This is an excellent picture to illustrate how the dilute washes out the normal black, both in coat color and pigmentation color. 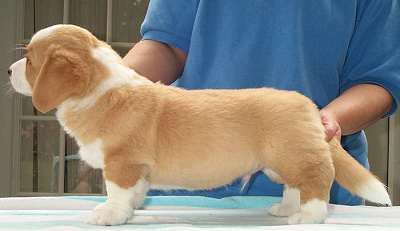 the overall chocolate brown, with normal point color. brown, this gene turns black into gray. 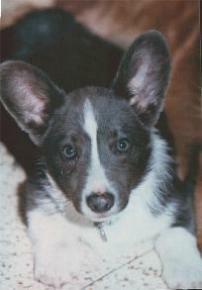 Pictured is a tri-color gray dilute puppy. because of their off-color noses.